The attitude of Russia towards climate change is extremely important for the success of climate change control policies worldwide, as Russia, with its cold climate and vast resources of carbon fuels, is one of the world’s biggest polluters. Moreover, Russia frequently comes across as not being very interested in containing environmental pollution. This book explores how issues to do with climate change are handled by the Russian media. It discusses how the state and economic elites have influenced Russia’s environmental communication, with the state’s control of the media strengthening since Putin came to power, and with control being exercised in some cases by ignoring or silencing the key issues. However, the book also shows how, recently, elites and the state in Russia have begun to realise that it is in the state’s best interest to pursue more climate-oriented policies. 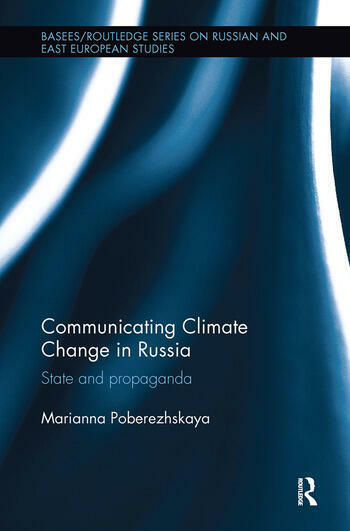 The book concludes by examining how the communication of climate change issues in Russia could be improved and by assessing the extent to which a recent change in state climate policy could mean that media coverage of climate change in Russia will keep increasing. Dr Marianna Poberezhskaya is a Lecturer in International Relations at Nottingham Trent University, UK.